The Sun Corridor MPO partnered with United Civil Group (UCG) to provide traffic counts on over 300 federally functionally classified roads within the MPO boundaries. UCG conducted traffic counts, created data tables, uploaded data into the Sun Corridor MPO Traffic Data Management System (TDMS), uploaded data into FHWA’s Highway Performance Monitoring System (HPMS) and provided Traffic Count Maps to the cities in the Sun Corridor planning region from CY 2016- CY 2018. 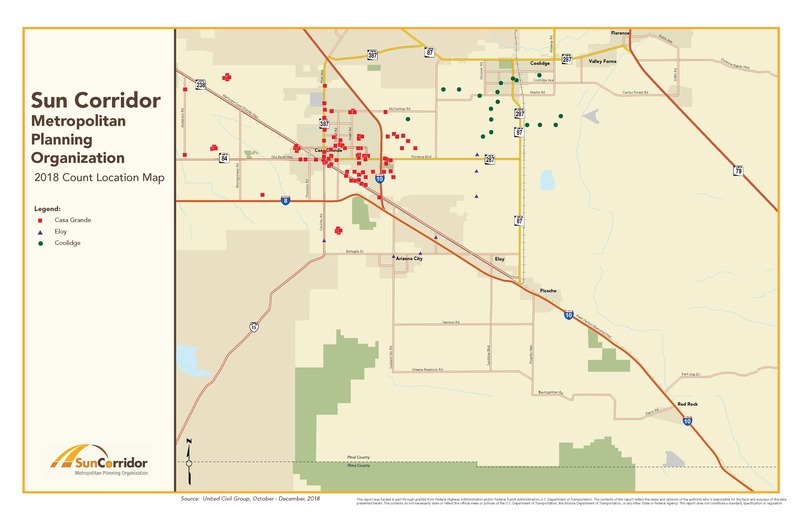 Click on the image above to see the location for all of the counts completed in the Sun Corridor MPO Region in 2018. For more detailed maps of each individual Sun Corridor Member Agency (including location and count) please click on one of the links below to see a closer view of each location. The information collected by these Traffic counts are stored in the Traffic Data Management System (TDMS). Traffic counts that are collected and provided to SCMPO by our local jurisdictions as well as by consultants specializing in traffic data collection are uploaded into this database. The Traffic Data Management System is updated immediately when a count is uploaded into the system. Anyone needing accommodations for the Sun Corridor MPO Meetings, please contact Irene Higgs at 520-705-5143 for assistance, within 48 hours of the scheduled meeting. The Sun Corridor MPO provides equal employment opportunities to all qualified individuals and values diversity at all levels of its workforce.